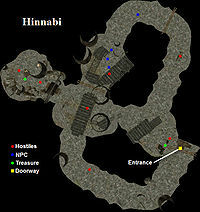 Hinnabi is a slaver hideout located on the island north-northwest of Bal Fell, east of Vivec. There are several hostile bandits guarding the cave, including one spellcaster. 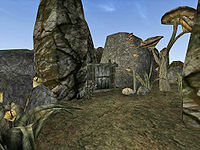 There is not much loot here, but what is to be found includes gold, scrolls, potions, armor, weapons, magic items and various sundries. Tels Girano holds the Hinnabi Slave Key. Additionally, Girano offers medium training services to anyone who can successfully sneak up on or calm him. He trains Short Blade, Light Armor, and Sneak.